Recollections of Albert Ruscoe, M.B.E. This is a transcript of a tape sent to me by Bert because of my interest in the old canals in the Telford area (see here), and is in the main his account of how the Muxton to Trench arm looked in the early years of the century. I have edited it as little as possible to preserve the freshness of Bert's words; but I have taken the liberty of moving some material which he added at the end to its due place in the narrative, and have removed the small hesitations and repetitions which are acceptable and inevitable in speech but undesirable in print. Some few additional notes and clarifications of my own are in [square brackets]. I have tried to paint a rough and quick picture of what the [Wrockwardine Wood] canal used to be, from when I was a boy, through the First World War and until I left in 1940 to go in the army. I was commissioned in the Royal Engineers in 1940 and I didn't come back from the Middle East until 1945, and I only stayed about a year in Shropshire; so my knowledge of the canal stopped about then. I think if I do a quick walk along the canal and tell you what it was like many years ago it will give you a much better idea of how things went, starting at Muxton Bridge and walking towards Lilleshall. That particular part of the canal was derelict when I was born in 1908; but from there on it started to buck up until it reached the large building we know as the Big Engine. Now the Big Engine was a pumping engine which pumped fresh water out of the mines into the canal. That means that the canal was always full to overflowing, and of course was very good for fish; but it only went from there onwards towards Wrockwardine Wood, it didn't go back into Lilleshall. If we walk on now from the Big Engine through the Donnington area towards Wrockwardine Wood we shall go underneath a road [St Georges Road] and eventually come to what was known as the Wide Hole, quite a large open sheet of water. Now it's my feeling that the reason it was a large sheet of water was so that the boats could be turned round. Now why should you turn round boats when it was a straight canal? So was that where the [canal from the Wrockwardine Wood] incline joined up? There is no possible way of finding out because in between the bottom of the incline and the Wide Hole is pit mounds now, and all covered in, so your chance of ever finding a route there is pretty much out of the question. Anyway, a little way from the Wide Hole the canal turns sharp left and goes underneath a bridge which spans the canal from what is known as the cinder hill across to the other side where there is another large building which was originally a winding engine, well before my time so that dates back into the last century. Since then it's been turned into a house, but the deep area inside the building obviously was where the rope went, winding up and down the cage. On the top of the Cinder Hill is what's known as the Central Hall. It's a small chapel which was originally the isolation hospital. Right, come back to the canal. Go straight on in a wide arc over to the right, then sharp left you come to Furnace Lane. 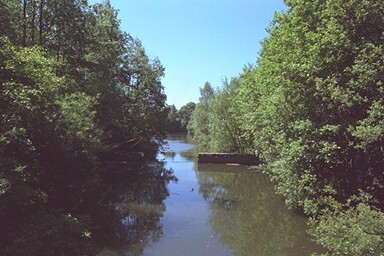 The canal goes under the bridge of Furnace Lane. On the right was a grocer's shop, Charlie Evans, and on the left was a Fish and Chip Shop [now the Victorian Fryer]. That takes you to Canal Side. Now looking across the canal to the other side, the field there was [later Sir Gordon] Richards' field where he kept his horses and ponies. Walk along Canal Side then continue on until you come to Wade Road and of course houses. This was formerly the football field for Wrockwardine Wood Football Club, and it was owned by Jim Wade who ran the White Horse pub. Starting there, the edge of the tow path is all brickwork, not just rough but very very well bricked. It must have been very costly even in the early days: they were very high class bricks, not just any rough bricks, and it was very good, and of course that particular part of the canal was always clean. The edge of the canal continues on from the football field until you come to the Rectory garden. The garden reaches right up to the Rectory which stands on Church Road. But on the right hand side before you get to the Rectory garden was Glasshouse Square, ten houses in a square; and backing on to those was Glasshouse Row, of nineteen houses. No 1 at this end as we approach it, is where I was born. The gardens of those houses ran almost down into Furnace Lane. They are enormous gardens, all of them. [Note 1] They all had a pig sty each because people kept their own pigs there. Between the Rectory garden and Church Road, over on the other side, is the Glebe Field [Note 2] belonging to the church; I suppose during the 1930s, there was a building built as a meeting place for the church; but when I was there there was nothing on the Glebe Field. On the right hand side, where in my day were allotments, at the turn oF the century was a glass factory which made green glass, hence the names "Glasshouse Row" and "Glasshouse Square". Quite regularly when you were digging in the garden you would turn up lumps of green glass. The pity is that we just threw them all away. Now they would be real antique pieces of glass dating into the last century, but to us they were nothing. Glasshouse Row ran right down to No 19 where the Church of England School used to be, backing on to the churchyard and the church; and that's the school I used to go to when I was three years old. In fact I left it when I was six and went to what we called the Board School - Shropshire County Council Education Board - which is further in towards Oakengates on the hill. It's ceased to be a school for a long time because the school now is on the way to Oakengates - the new school further along the new road [Wrockwardine Wood Arts College, New Road]. It's interesting to know that some time after that school was built, in the playing fields a large hole appeared. It was a mine shaft which hadn't been filled in, it had just been covered over. Fortunately nobody was there and nobody was hurt. My grandparents and parents and other members of the family are buried in Wrockwardine Wood churchyard. The two windows at the front end are [memorials] to my mother and father. Anyway, back to the canal, which now runs past the Rectory garden and goes in a straight line towards the bridge at Church Road. Having got to Church Road, remembering that the whole of the edge of the canal is brickwork still, we come to the mill. The mill is Bullock's Flour Mill, which has been there since the beginning of the century. In my early days the canal was navigable up to the mill, and grain used to come up in long boats which were unloaded for the mill, and there was a crane there to lift the bags of grain out. There was always some spill of grain so needless to say it was a good place for young fish. The canal had a lot of fish in it - roach, perch, tench, pike - so there was always some fishing going on with the kids - not very successfully, but the odd fish was caught now and again. Now the mill belonged to the Bullock family for many years. It's interesting to know that in the church the Eastern window is to one of the Bullock family, and in the church yard are two large monuments to members of the family. Leaving the mill and walking on towards Teagues Bridge you then go under a small bridge [Church Road] which connects what became the recreation ground and the motte (or the moat). The canal then continues in a wide half-circle so that it is possible to walk from the bridge that I mentioned on a straight line and rejoin the canal again on the other side via a footpath. There was a disused mine on there, but the interesting bit about going on that footpath was there was a freshwater stream which never froze over, it just kept running all the time, and in it was watercress, stickleybacks and newts. Well of course, they're long since gone, unfortunately. Reaching Teagues Bridge [Wombridge Road]: the bridge connects by road down to the Trench, and on the other side on to Wombridge and Oakengates [now bisected by Wrockwardine Wood Way]. That road is pretty rough, or was in my day, and of course there is a pub up there as well, on Teagues Bridge [since replaced]. From Teagues Bridge you then go fairly straight to the end of the canal where there is an overflow, because there was water running all the time, and that's where the [Trench] Inclined came with two vehicles, one up and one down, conveying the boats from the canal at the top to the canal at the bottom which is in between the Trench Pool and the Shropshire Ironworks [Trench Lock industrial estate]. The incline was still working at the beginning of the First World War: I had a ride on it, and I've seen boats come up those vehicles on that incline from one level of the canal to the other. Well from the end of the canal by Shropshire Ironworks is Trench Lock, which of course is now filled in. The canal used to go underneath the main road there, and on the right hand side was a brick building which housed the clerks of the railway goods office. One of the clerks was actually in my form at the High school. Anyway, back to the Trench Lock. There is no sign of the canal at that particular piece, but it used to run underneath [Trench] road and continue on and swing right round Sankeys Steelworks. Sankey's Steelworks, [later] Gesteen and Nettlefold's, part of the big combine, [is now GKN Sankey]; but in my day it was owned by the Sankey family. The canal continues on, and eventually, getting down as far as Kinnersley, joins what we used to call the "bottom canal", which is the canal which joins Stafford and Shrewsbury. I'll mention that in a moment, but that gives you an idea of what is virtually the end of the Wrockwardine Wood section. Of course the whole section and the bottom canal as well is all part of the Shropshire Union Canal, properly speaking. In fact if you go back to the bridge near the mill, in the road there was a brick pillar, on which was carveD S.U.By - Shropshire Union Boundary: in other words, the boundary of the canal lay where that concrete post was. Now if I can leave Wrockwardine Wood canal and take you to another one: if you leave Trench and go towards Newport you eventually come on the right hand side to Farm Lane [replaced by Wrekin Drive] and on the left hand side a very small road leading underneath what was the London and North Western railway (Shrewsbury - Stafford). In my young days there was a railway line that ran down there, in between all the fields, but nowadays the whole area is the BoD Ordnance Depot, which was moved from the Woolwich Arsenal in the late 1930s, just before the war, and set up in Donnington. This railway ran through there for I suppose about three quarters of a mile until you came to the end of what was known as the Humber Arm of the canal. It was an arm of the main Stafford - Shrewsbury canal, and when I was a schoolboy there was an awful lot of canal traffic. At the end of Humber Arm was a quay, well maintained with chutes and cranes to shoot coal into the long boats for the canal, and also of course there were stables there for the horses, because the canal boats were all pulled by horses. The Humber Arm all was well-maintained: in fact the weeds were kept cut and there was always an overflow of water. I'm not sure where the water came from, whether some of it came out of the pits further up or was pumped in at Stafford - it could well be from one of the Stafford pits - but it was certainly full of fresh water at all times, and of course lots and lots of fish, so there was plenty of fishing going on there. Between the two wars the canal was in full use with long boats which we now call canal "narrowboats", but we used to call them "house boats" because people lived on them. The road running down underneath the old [Wrockwardine Wood] incline was a railway running from somewhere near St Georges and presumably joining the canal. It is known as the "pig rails" because it carried, not pigs as porkers, but pig iron from the blast furnaces. There was a lot of ironwork going on: it was a real black area with dozens and dozens of mines. The first one to be closed was the Freehold (? ), the second was the Grange pit. That only left the Granville working, and that worked for a time and then that closed. The old idea was that you weren't allowed to mine under special areas like reservoirs or canals or main road or anything like that: you had to skirt them or leave the block of coal underneath there so that there would be no subsidence. But when the Second World War came along, of course all that was swept aside and mining continued just about everywhere, including underneath Lilleshall Abbey, so the abbey - or what was left of it - suddenly started to tilt over and had to be all shored up, which was a great pity.